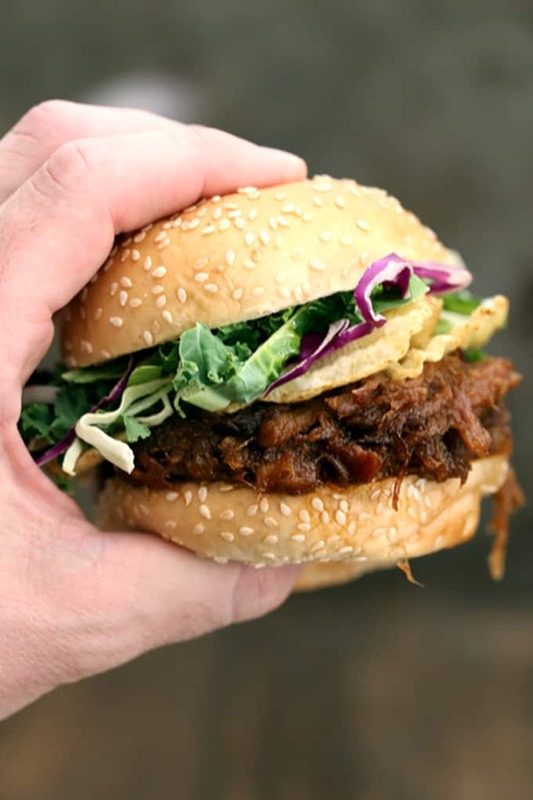 This four ingredient Slow Cooker Cherry Cola Pulled Pork takes less than 10 minutes to prepare which guarantees you have no excuse to not add it to your dinner menu, stat. A pork shoulder roast, cherry cola and brown sugar simmer away all day to create a sticky sweet sandwich filling that’s then spiked with your favorite barbecue sauce. We officially closed on our new house on Friday. Such a relief! We’ve actually been renting our own house for the past two weeks but now it’s officially ours. As are the mountain of boxes, bubble wrap and packing paper strewn about every available inch of floor. I’ve been living each day on repeat. Wake up, get everyone breakfast, unpack, run some type of errand, lunch, blog work, unpack, dinner, family time, blog work, go to bed to start everything over the next day. No complaints, I just feel like I need a few more hours each day to work on the unpacking portion of my day. 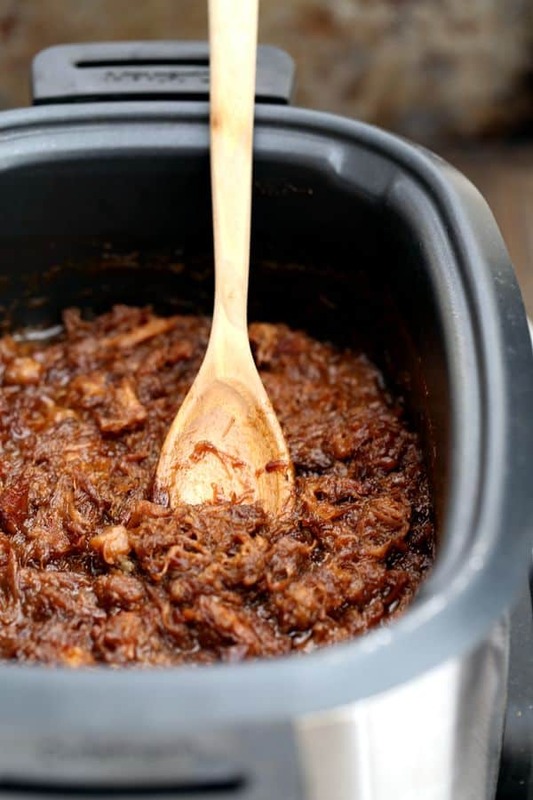 Enter my Slow Cooker Cherry Cola Pulled Pork. Focusing on unpacking means that my thoughts are absolutely not centered on making dinner for everyone. Making dinner takes away from unpacking minutes, you know. So instead of choosing whether I’m feeding more family or putting all of our worldly possessions away, I’ve taken matters into my own hands by putting my slow cooker to work for me. While I’m getting everyone breakfast, I simply toss dinner into the slow cooker and then when the clock strikes 5 o’clock-ish, dinner is close to being ready. Winning. 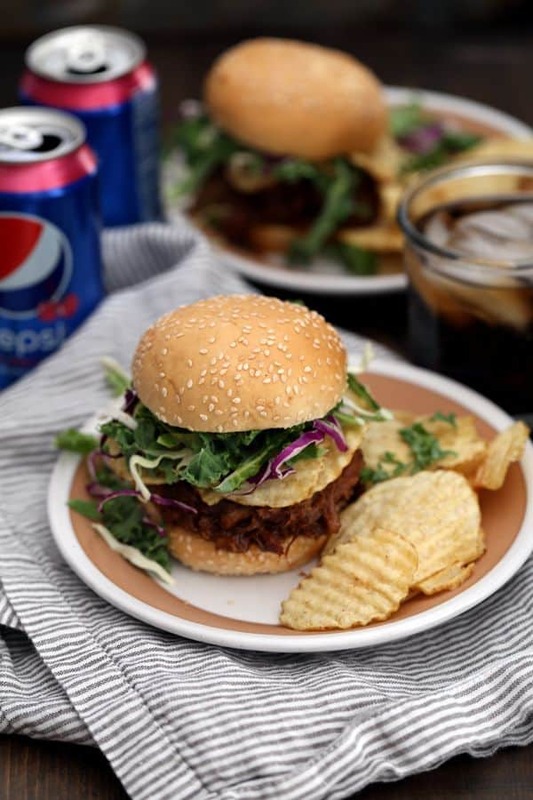 My Slow Cooker Cherry Cola Pulled Pork is one of my recent dinner favorites that involves little effort on my part yet has my mouth salivating all day as it’s aroma wafts from the kitchen. This four ingredient dinner takes less than 10 minutes to prepare which guarantees you have no excuse to not add it to your dinner menu, stat. A pork shoulder roast, cherry cola and brown sugar simmer away all day to create a sticky sweet sandwich filling that’s then spiked with your favorite barbecue sauce. I love to add potato ships – crunch! – and a coleslaw mix – go veggies! – to my sandwich for a quick and easy dinner. 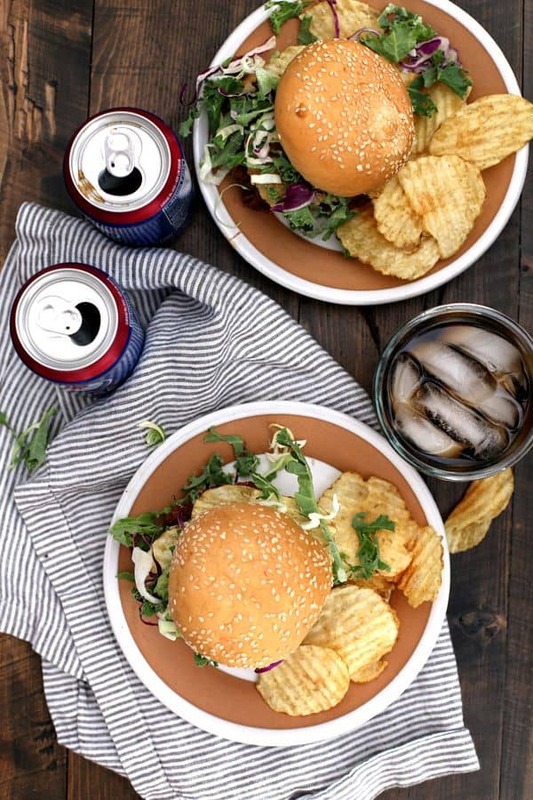 Sandwiches, like these made with my Slow Cooker Cherry Cola Pulled Pork, prepped in the slow cooker are a definite rescue when time is limited at the dinner hour. My two ingredient Slow Cooker Pepperoncini Beef Sandwiches are so incredibly easy I could prep them blindfolded, if need be. If you’re preparing a meal for a crowd, my Slow Cooker Chicken Parmesan Sandwiches are always my go-to meal and I’ve yet to meet someone that hasn’t fallen in love with them upon first bite. And if you’re wanting another pulled pork recipe, I love the subtle kick from my Pineapple and Habanero Slow Cooker Pulled Pork. Needless to say my slow cooker and I are inseparable! SIDE NOTE: If you’re looking for an amazing slow cooker, I can’t recommend the one I chatted about in this Slow Cooker Pork Roast and Cherries enough. I mean, the fact that it’s non-stick and is a breeze to clean is amazing in and of itself, but it also will brown, simmer and steam as well. I have three slow cookers and this is the only one that has earned permanent residency in my kitchen while the others sit in storage until needed. My friends also are putting their slow cookers to work for them to make the usual what’s for dinner conundrum a thing of the past. These dreamy Slow Cooker Chicken Alfredo Sandwiches would have me watching the clock in anticipation of our evening meal. I also love the idea of preparing these Crock-Pot Chicken Philly Steak Sandwiches when having friends over to watch a game. And the amazing flavors of this Slow Cooker Hoisin Shredded Chicken Sandwiches with Asian Slaw – well, I wouldn’t complain if it was set in front of me and I’m betting no one else would either! In a 6 quart slow cooker, add pork shoulder roast, cherry cola and brown sugar. Remove pork and shred into bite size pieces with two forks. Return to slow cooker and simmer until thickened. Stir in barbecue sauce and serve. 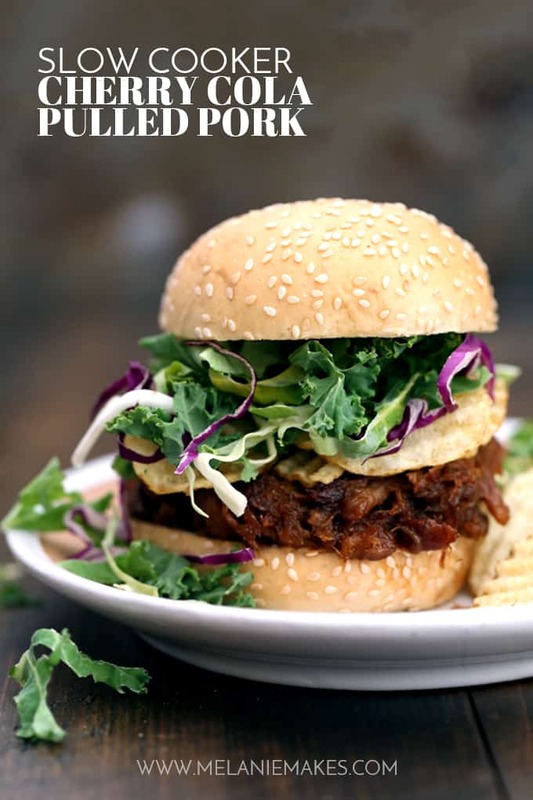 This pulled pork sounds fantastic - great giveaway too! Looks incredible! Slow cooked pork is a beautiful thing! I am going to have to try this out! 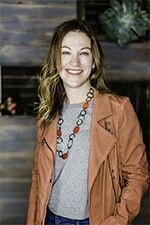 Congrats on the house! 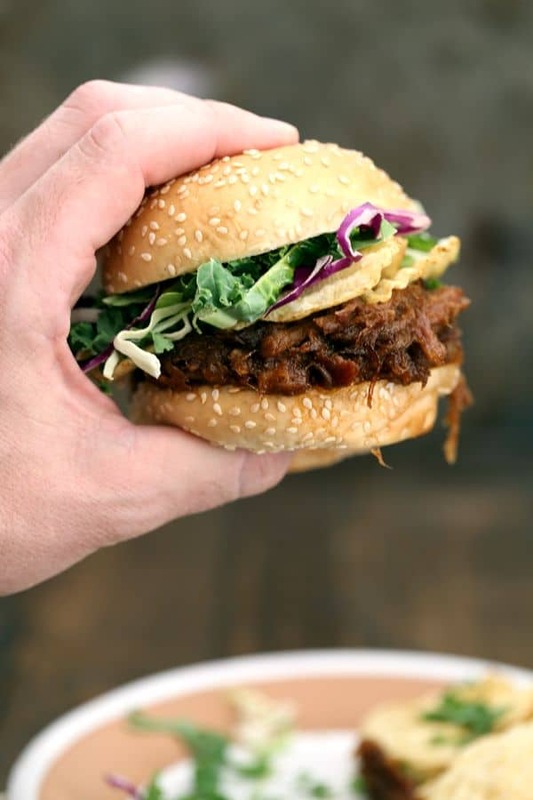 I am all about slow cooked meals during the summer and these are some mighty fine pulled pork sandwiches! Ekkk! That is going to be us in about a year - looking for a new place to live in an undetermined city as of now! I better start collecting boxes now! Godspeed, Beth! I'm just unpacking the last of our boxes now! I make a recipe very similar to this, but I use 12 ounces of beer. Occasionally, I have used apple juice. It had never occurred to me that I could use soda. Of course, that might be because we usually only have diet soda and it doesn't cook well. Great idea. I will definitely be trying this. Let me know what you think if you give it a try, Patti!